RxDentistry: Question A healthy 25-year-old man presented to the surgical clinic with a hole in the roof of his mouth that allowed nasal regurgitation of food when he ate. The hole had been present for a year, and he requested surgical correction. Which one of the following drugs of abuse is most typically associated with the illustrated complication? Question A healthy 25-year-old man presented to the surgical clinic with a hole in the roof of his mouth that allowed nasal regurgitation of food when he ate. The hole had been present for a year, and he requested surgical correction. Which one of the following drugs of abuse is most typically associated with the illustrated complication? Perforation of the nasal septum and palate are well recognized complications of intranasal cocaine use. This patient reported a 5-year history of nasal cocaine use from which he had recently abstained. Physical examination revealed a large perforation of the nasal septum and midline palate. Local complications of intranasal cocaine abuse include chronic rhinitis, sinusitis, epistaxis, ossification or necrosis of the nasal septum, and in rare cases, palatal perforation. Use of cocaine, a potent vasoconstrictor, can lead to ischemia, necrosis, and ulceration, as seen in this case. 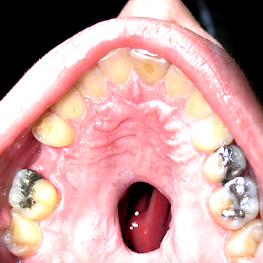 Other causes of palatal perforation to consider include infection (syphilis, tuberculosis, or fungal infection), Wegener’s granulomatosis, sarcoidosis, neoplasms (salivary or squamous cell), and midline lethal granuloma, a type of T-cell lymphoma. After consultation, the patient did not return for follow-up.